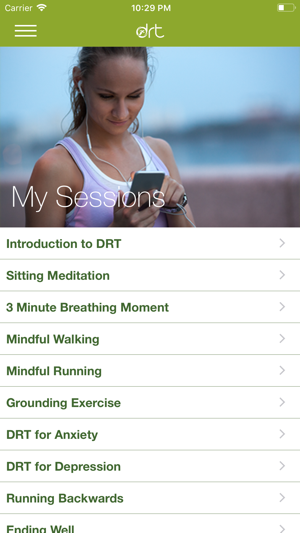 The Dynamic Running Therapy app contains several different mindfulness meditation exercises including mindful sitting, walking and running meditation. 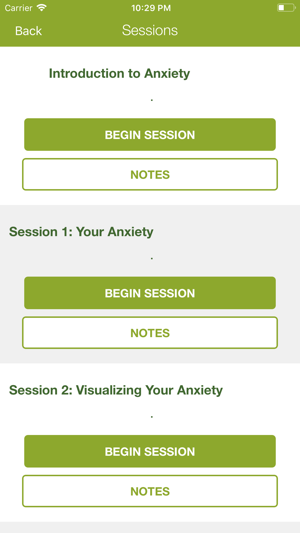 Developed by psychotherapist and mindful running expert William Pullen, author of “Running with Mindfulness” (Penguin), the app also contains programs for the treatment of depression and anxiety. 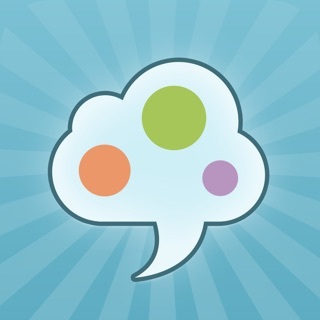 The app brings together elements of mindfulness, regular talk therapy and movement. It allows you to go out and take active steps towards feeling better, providing you with a sense of empowerment, momentum and confidence. It doesn’t matter how fit you are, it works if you walk with it too. It’s about getting out, getting moving, breaking old habits and starting new ones. 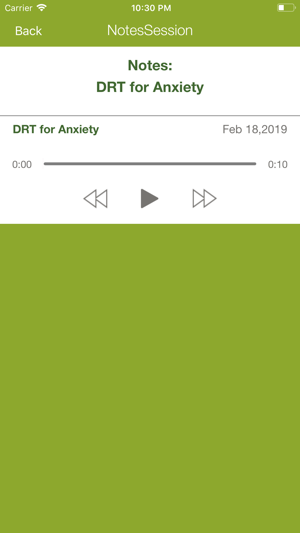 "It may sound grueling but the latest trend for therapy while you run could be the key to kicking the blues"
DRT takes you, step by step, on a journey made up of three parts. The first of these is the mindfulness element. This is designed to relax you, taking you out of your thoughts and back into your body and environment. There are several mindfulness meditation exercises you can pick from including The Grounding Process, designed to prepare you for the day’s walk or run. 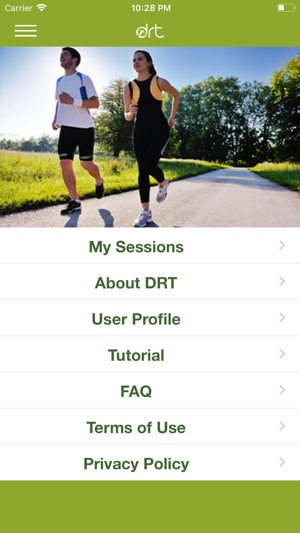 The second part of DRT is movement - running or walking. You choose the pace that suits you. You’ll find that as you commit to getting out and getting going, this activates a sense of momentum, confidence and resilience. 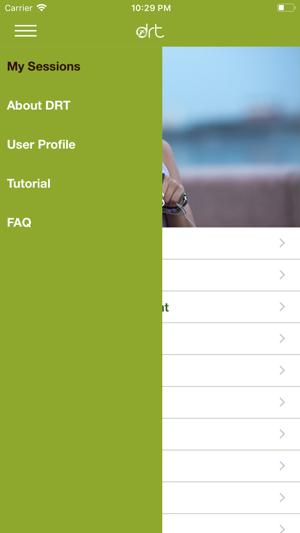 The third part consists of the questions you will run with each day. These questions are carefully designed to help get a better understanding of your situation. They explore your relationship with yourself, your inner dialogue, your experiences and your expectations. 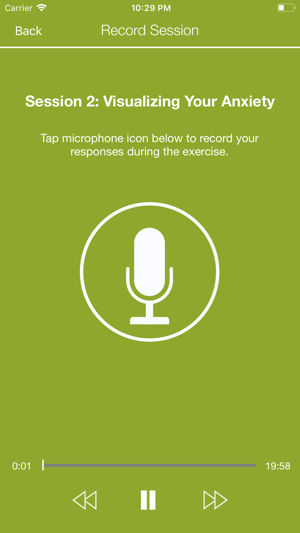 As you run with these questions you will be prompted to record your thoughts and responses which you can then use for the Final Synopsis. The Final Synopsis marks the end of your DRT journey. The process of writing the Final Synopsis will help you to know and acknowledge your story. It is a record of the DRT journey you have been on – what you have learned, felt, and understood. It will help you see how your story came about, where you are now, and where you would like to be in the future. It may be that you want to work through childhood or relationship issues. Perhaps you are undergoing an important change in your life or are confused by your options. Maybe you are experiencing prolonged anxiety, depression, emptiness, or a loss of meaning or purpose. 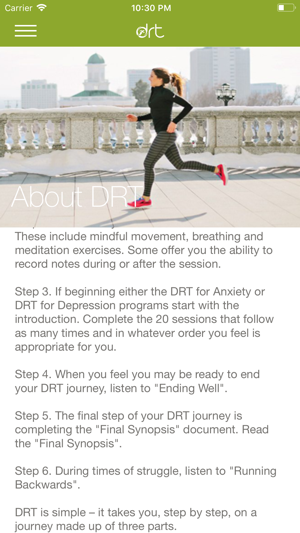 DRT can help you make sense of your situation and help you live a more fulfilling life. It can give you new tools to handle conflict and challenge, and free you from behaviors that hold you back. Emphasis is placed on gaining a fundamental understanding of the issue at hand. When did it begin? How bad is it and when does it get better or worse? What do you do to cope? This process may take time, may be revisited, and the pace is set by you. 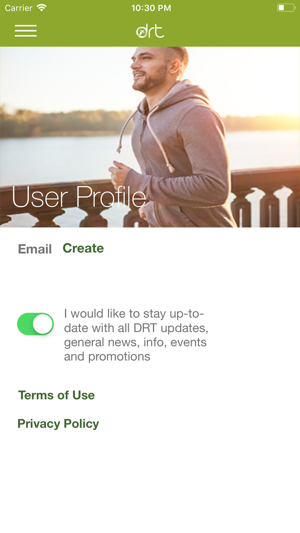 DRT helps you explore what you would like to change specifically, and what this change would look like. How would this change affect your life and what would others notice? What are some of the steps you can take toward it? How can you recognise and capitalize on a step that has been useful? What helps to motivate you and keep you motivated? •	Step by step guide to help you navigate your therapeutic journey. Theoretical foundation: DRT draws on Person-Centered, Existential, CBT, CAT and Solution-Based psychotherapy. It aims to facilitate wholeness between the feeling, behavioral, cognitive, and physiological levels of functioning.